Explore the classic Provence, combining both the Alpilles and the Luberon mountain ranges, passing scenes painted by Van Gogh as well as golden hilltop villages. You will follow Van Gogh’s footsteps through the olive groves of the Alpilles to the spectacular village of Les Baux. You then will explore the Luberon Mountains: its tight gorges and forest paths leading you from one magnificent perched medieval village to the next. The hills are dotted with old stone farmhouses and centuries-old stone huts, the fields blanketed in wildflowers and aromatic herbs, orchards and vines. 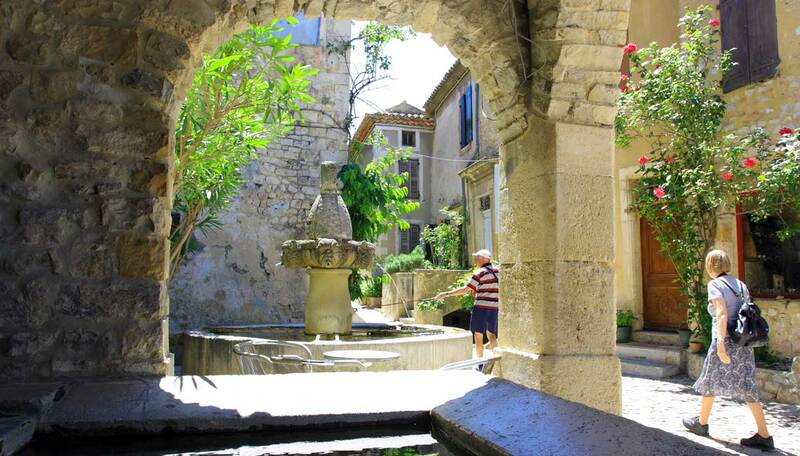 Your journeys will take you through the famed villages of Fontaine de Vaucluse, Gordes, Goult, Bonnieux and Saignon. You will end your trip in the town of Isle-sur-la-Sorgue, with its antiques, its Venice-like canals, and its famous Sunday morning market! *A high season supplement will apply during peak booking periods. *A single supplement charge will apply for solo walkers. ACCOMMODATION In charming 3* hotels/guesthouses on a bed & breakfast basis. All rooms are en-suite. The standard hotels of this trip are listed below. If a hotel is fully booked, then we will book a similar one for you and inform you about the alternative booked. You can also book additional nights at any of the hotels along the way. AVAILABILITY You can start your trip on any day of the week (subject to availability) from March 1 to June 30, and from August 27th to November 15th. This trip is not available in July & August, because of path restrictions ( fire risk). This trip is suitable for people who are used to regular and sustained exercise (whether walking, cycling, aerobics, etc.) and who can handle walking uphill (slowly) for up to 2 hours at a time. Walks are generally under 5 hours, on various types of terrain – though nothing technically difficult – with up to 600 m of climbing per day. Your trip begins in the heart of Avignon. A medieval town on the banks of the mighty Rhône River, Avignon hides many treasures: The Pope’s palace, the 12th century bridge, the still intact 14th century ramparts and many museums and churches. Meander through a labyrinth of cobbled streets and discover cafés in open squares, shaded by plane trees. OPTION A: Distance: 10 km | Ascent: 300 m | Descent: 300 m | 3½ hrs approx. OPTION B: Distance: 18 km | Ascent: 550 m | Descent: 550 m | 6 hrs approx. Transfer to Saint-Rémy. You start from the picturesque Saint Rémy into the Alpilles hills, then along the fabulously panoramic ridge-line. Along the way, take the time to visit the Saint-Paul de Mausole monastery, where Van Gogh spent over a year, creating over 150 paintings, and some of his best work. Distance: 12 km | Ascent: 270 m | Descent: 100 m | 4 hrs approx. Today’s scenic forest path hovers high above the valley, giving you spectacular views of the hills to the north and the Mediterranean Sea to the south. Your walking path descends through the sculpted limestone “valley of hell” towards the perched village of Les Baux de Provence: its homes packed tightly and defiantly on top of the cragged rock, earning its listing as one of the most beautiful villages in France. Transfer to Gordes at the end of your walk. Distance: 11 km | Ascent: 320 m | Descent: 250 m | 3½ hrs approx. Gordes is perched high above the Calavon valley, its majestic stone homes rising dramatically in concentric circles up a steep hill, crowned by the Chateau de Gordes. Atop a vast plateau, you cross through lavender and thyme-laden fields dotted with old stone huts, on your way to Sénanque Abbey – a jewel of 12th century Romanesque architecture – You will have time to explore the abbey before returning to Gordes via a cobbled path. Distance: 16.5 km | Ascent: 450 m | Descent: 350 m | 5½ hrs approx. Short morning transfer to Goult, a timeless medieval village of medieval untouched by modern tourism. You walk among the ruins old stone farmhouses to the village of Lacoste, crowned by the imposing ruins of the castle of the Marquis de Sade. Then you continue to Bonnieux, another gem of the Luberon and one of the centre-stage villages in Peter Mayle’s A Year in Provence. 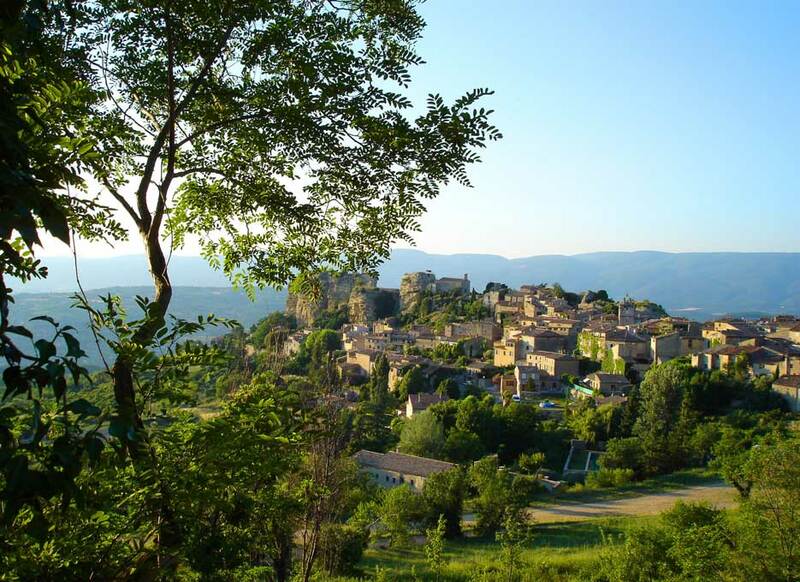 Beyond Bonnieux, you enter the Grand Luberon, following alongside a lavender field before reaching Buoux castle, and the village of Buoux itself. Spectacular arrival at the Auberge des Seguins, in the depths of the Aiguebrun gorge: a restored 17th century goat farm. This is a real off-the-beaten-track gem in an idyllic setting. Transfer at the end of the day to Bonnieux . Distance: 11 km | Ascent: 400 m | Descent: 300 m | 5 hrs approx. You walk along the base of the Aiguebrun canyon to the hidden hamlet of Sivergues. Its stone wall terraces the only remains of the cultivated fields that once surrounded the tightly-packed handful of homes. Continue through the vast lavender fields and truffle oak plantations to Saignon. Transfer at the end of the day to Isle sur la Sorgue, where you stay in the heart of the town. This veritable island of a village is surrounded by the crystal clear waters of the Sorgue river. The town’s Sunday market is among the most colourful in Provence, while its canals are bordered by quaint cafés, restaurants, and antique shops. Lose yourself among a labyrinth of narrow streets and in the town’s warm, Provençal charm. Your tour ends in l’Isle-sur-la-Sorgue after breakfast. You can take a train to Avignon for onward travel or to Marseille airport. The closest airport is Marselles-Provence Airport. From Marseilles Provence Airport you can take a train into Avignon (1 hour). Alternately you can fly into Paris Charles De Gaulle International Airport. From there, you can take a train south to Avignon (a journey of just over 3 hours). For train information please visit the SNCF website. / From Isle sur la Sorgue you can take a train or bus to Avignon. The train runs every hour and takes about 30 mins to reach Avignon. There are a few bus companies operating this service, such as Lignes Express Régional. Check train timetables on the SNCF website. We are a travel company based in Charlottenlund, Denmark which arranges self-guided walking tours.